Automatic Enrolment Pension scheme contributions are set to increase on 6th April 2019 to a total of 8% of qualifying Earnings of which 3% must be paid by the Employer. All Normans Payroll clients will have this increase effected Automatically on their next payroll onwards from 6th April 2019 ensuring they are on top of latest legislation. Auto enrolment is the UK’s new workplace pensions initiative – geared towards motivating the working population into saving towards their retirement. It is a legal requirement for all employers to provide a pension that meets minimum standards by 2018. All employees over age 22 and below State Pension Age, who work or ordinarily work in the UK, must be enrolled into a pension scheme as long as they earn over a certain amount per week or month. How do I go about registering a scheme? We recommend using an expert to set up your scheme to ensure you have complied with all of the onerous legislation surrounding Auto Enrolment. Here at Normans we have a recommended Independent Financial Advisor who can help set this up for you. Once your scheme has been set up you will need someone to administer the scheme on an ongoing basis for items such as writing to new employees to inform them of the scheme, dealing with Leavers, etc. and again we recommend you use a pension expert such as our recommended IFA for this service. What are Normans Charges for Auto Enrolment? In terms of processing your payroll and calculating your deductions, there is no extra charge or fee. We just ask for a clear instruction on your pension scheme type so that we can administer your pension calculations accurately. If you use our recommended IFA we will liaise with them directly to obtain this information. If you require us to upload your Pension information to your pension provider we only charge £6.00 per upload or we will give you a report for free so that you can upload it yourself. Making Tax Digital – Nothing to worry about. I am sure by now you will have heard of or been written to about HMRC’s digital tax initiative called Making Tax Digital or MTD. Here at Normans we have been ahead of the game for some time now as we already keep our client’s data electronically and submit our returns through Xero software – Ta-daa! Making Tax Digital for business (MTD) begins on 1 April 2019 with MTD for VAT. From that date, VAT-registered businesses above the threshold of £85k will have to keep digital records and submit VAT returns using compatible software. 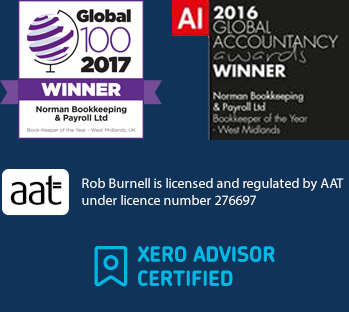 Here at Normans we only use Xero software (Link - https://normansbp.co.uk/cloud-bookkeeping-solutions/ ), and this is listed by HMRC as being MTD compatible. Other components of Making Tax Digital, such as income tax and corporation tax, have been placed on hold until April 2020 at the earliest. Contact us today if you are concerned about MTD and how it impacts your business and we can tell you how we can help.